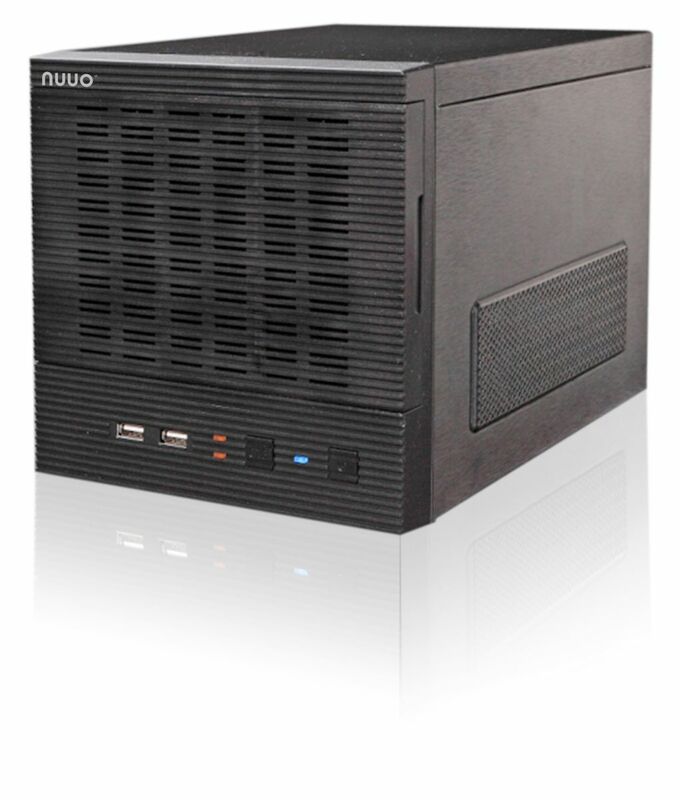 NUUO Titan NVR is NUUO’s Linux-based open platform recording solution. It is built on Linux Foundation, with cross-platform Windows and MAC client software. It supports up to 64 channels of megapixel recording with 250 Mbps throughput. It also comes with a myriads of features that will sure to fulfill even the most demanding projects. Supports over 2300 camera models from over 100 vendors. Stable, reliable and virus free. NUUO Command Chain Technology Synchronize user accounts and critical events across multiple servers, and 400 channels of centralized live viewing simultaneously. Camera support (ONVIF compatible) Open platform support multiple camera brands, models and RTSP stream, UPnP search and Onvif ProfileS. The camera support list is updated every month. (http://www.nuuo.com/wiki.php for details). LiveView spot-out (Local display) Titan support maximum of 16CH(NT-8040R/ NT-8040RP) or 4CH(NT-4040/NT-4040R) VGA spot out. Through view tour, it can connect 64CH video and display 16/4 CH each view. * NT-4040/NT-4040R: Support 4CH local display in D1, 25 FPS, with 64CH record and 30CH LiveView simultaneously. * NT-8040R/NT-8040RP: Support 16CH local display in D1, 30 FPS, with 64CH record and 128CH LiveView simultaneously. Please check NUUO spec sheet for more detail. Dual gigabit Ethernet ports Titan server hardware is equipped with 2x gigabit ports. User can separate the recording stream from viewing stream to ensure the cleanest recording pipeline. Camera Dual (2nd) Stream support User who suffers from remote bandwidth bottleneck can utilize Titan's Dual Stream function. It supports multiple streams from the camera to allow high resolution recording and low bandwidth remote view. (Supported cameras list). Centralized I/O and event respond systems Titan supports 4 different external events and 3 system events. External events include camera motion, camera signal lost, camera input trigger and I/O box input trigger. User can be instantly notified of these events through NuClient, Email and special outputs such as siren. Scheduled Backup Automatically back up the recorded file through FTP to another storage device locally or remotely. Cross platform NuClient support both Windows and MAC OS. NUUO Image Fusion Technology User can manipulate the camera image as desired to create the best viewing angle for each camera or stitch up to 10 cameras together to form a consecutive single view for easier viewing. • Centralized view: Show videos from multiple servers. single E-Map to easily find and track device location. • Centralized I/O Panel: Manage all I/O devices on one I/O panel. • Centralized Event Panel: View and search all event on one event panel. Intuituve E-Map Support multiple layer of E-Map. User can drag and drop cameras and I/O from different servers onto the same map. Furthermore, icon indicator will change status when event happened and instant playback video will popup via double click. Dual stream support Remote live view bandwidth control (Original / 500 kbps / 100 kbps). User can freely choose the desired streaming profile based on the bandwidth available. Panarama 360° PTZ Support Immervision lens and VIVOTEK fisheye cameras. Remote server configuration User can remotely configure Titan server through the web client without being physically at the server. View, View group and View tour Titan NVR support public view for all user and private view for each user. User can freely access Public View or setup its own customized view list for private access. It also support View Tour to loop through different selected Views. Mobile App NUUO iViewer is a free mobile app that allows you to view video from your NUUO surveillance systems. User can take a snapshot, control physical/ digital PTZ and digital input and output devices. For more information, please search "NUUO" at Apple Store or Android Market. Twin Clients Software client and web client are 100% identical in control and functions. User can access Titan anywhere through browser without having to install the client software. I/O box Support NUUO All-in-1 I/O Box (SCB-A08). Support up to 256 NUUO I/O boxes (SCB-C24/C26/C28). APC Support APC Uninterrupted Power Supply - Smart-UPS 750 VA / APC Back-UPS 500 ES / APC Smart UPS 1500 / APC Smart UPS 3000 (http://support.nuuo.com for details). • Stream up to 256 camera connections to multiple clients simultaneously for Live View. • Manage multiple servers and 400 channels of centralized live viewing simultaneously. Server-Client Architecture: Centralizes all video data only via Titan NVR to remote clients(NuClient). With this centralized structure, total camera loading remain the same level, thus ensure good recording quality even with maximum of remote client access. High recording throughput (250Mbps): NUUO Titan NVR utilizes a redefined recording engine named File Ring. File Ring was engineered from scratch to handle high megapixel recordings by changing the way hard drives store and retrieve video data. It can process large amount of data throughput boosting Titan's recording performance to 64CH 5 - Megapixel cameras (H.264, 15 fps, moderate traffic). Main-Sub server structure: User can access multiple server video through one single client. NUUO Command Chain Technology: Synchronize user accounts and critical events across multiple servers, with 400 channelof centralized live viewing simultaneously. High channel streaming out: Every Titan stream up to 256 camera connections to multiple clients simultaneously for Live View. Local display: Titan support maximum of 16CH(NT-8040R/ NT-8040RP) or 4CH(NT-4040/NT-4040R) VGA spot out. Through view tour, it can connect 64CH video and display 16/4 CH each view. Dual gigabit Ethernet ports: Titan server hardware is equipped with 2x gigabit ports. User can separate the recording stream from viewing stream to ensure the cleanest recording pipeline. Support full SDK: Open platform support full SDK for integration with third-party systems such as access control, automation, burglar alarm, video analytics and others. Automatic Camera Model Detection: Titan NVR can automatically search for IP cameras in the network (camera should support UPnP protocol). For those unsearchable cameras, user can manually insert it. The auto detection function will help the user to find the brand and model of the camera after specifying its IP address. Multiple codec support: Titan NVR supports H.264, MJPEG and MPEG4 for best quality and storage usage. Event & Action: 4 camera events including motion detection (if the camera has it), connection lost and camera input; 1 input event from remote I/O box; 6 system events and daily system report through E-mail; 3 instant alarm responses supporting on screen display, output and Email. Online RAID Capacity Expansion and Level Migration: Support RAID 0,1,5 and 10 for maximum capacity or data protection at the HDD level. The authorities of different kinds of users: Web Viewer logins to the Recording Server via 4 different user groups: administrator, power user, user, and guest. Each user group has its own distinctive privilege in system configuration, live view and playback camera. Log System: Hardware Log keeps track of system operation; NVR Event Log for camera status, user access and special event. License management: Titan NVR can extend to 64CH recording by license activation. It supports online/ offline activation and transfer. Cross platform: NuClient support both Windows and MAC iOS. NUUO Image Fusion Technology: NUUO Image Fusion Technology can manipulate camera views by changing its viewing angle and image size make viewing easier in both live view and playback. Moreover, users can stitch multiple cameras together to form a unified single view from up to 10 different cameras. • Centralized view: Show videos from up to 100 servers. and instant playback video will popup via double click. View, View group and View tour: Titan NVR support public view for all user and private view for each user. User can freely access Public View or setup its own customized view list for private access. Instant Playback: Allow to play the last few minutes of video channel on NuClient. User can view instant playback via double click event, E-Map notification, or video tool bar. The intuituve GUI enable user easily export instant playback video or sync to Playback. Stream Profile: Live display multiple camera streams with lower bitrate, while still having good quality recorded videos. Multi-view: Titan NVR can duplicate the same live view video onto multiple channels and digitally zoom in to see the details of different spots on cloned channels without losing the original live view video. Panorama 360Ëš PTZ: Several modes are supported on live view and playback. ImmerVision: Original mode, PTZ mode, Quad mode and Perimeter mode. Please refer to ImmerVision's website for qualified cameras. Vivotek FE8171V: Original, Rectilinear mode, Single-view panorama mode and Dual-view panorama mode. Joystick: Titan NVR supports cameras physical PTZ and software enabled digital PTZ function. Twin client: Support identical, full featured software client and web client. User can access Titan anywhere through browser without having to install the client software. Multiple Mobile Clients: NUUO iViewer is a free mobile app that allows you to view video from your NUUO surveillance systems. User can take a snapshot, control physical/ digital PTZ and digital input and output devices. For more information, please search "NUUO" at Apple Store or Android Market. Post-Recording Processing: Intelligent search, Image fusion, digital PTZ, and Panorama 360Ëš PTZ. Intelligent Search: Search recorded video for 5 events including motion start, motion stop, unit connection lost, manual record mode start, and manual record mode stop. Evidence Export: Snapshot and print video image in BMP/ JPEG; backup video in DAT; save video in ASF/AVI/Original AVI/ MOV. Action Notification: Notify users on camera and system event through sound, digital output, and Email. Auto Backup: Automatically backup the recorded video of the date before to a designated FTP server. Manual Backup: Manual backup of any Titan NVR. Verification tool: Protect for original recording from alternation with our watermark verification tool. Remote I/O Box: I/O signals of NUUO I/O Box are converted to Ethernet through converter, which enables Titan NVR to do more sophisticated application, such as starting recording when input triggered, triggering output as an event happened, and much more. Redundant power support: Titan NT-8040RP model support redundant power which ensure seamless power supply even when power cord damage. User can also exchange and fix power supply without stop machine. APC UPS: Continues to feed the Titan NVR power at an event of power outage.